The two things in this world that really make me cry are marathons and the end of The Notebook, but I’ve found a third thing to add to the list—this inspiring and heart-warming op-ed from 10-year-old Girl Scout Alice Paul Tapper. “Last year on a fourth-grade field trip, I noticed that all the boys stood in the front and raised their hands while most of the girls politely stayed in the back and were quiet. It made me upset,” she wrote in the New York Times on Monday. Very observant, young Alice, and very correct. Instead of just noting this curious difference between the sexes and carrying about her day, Alice unpacked it with her mother and then decided to take action. I told my mom that I thought girls weren’t raising their hands because they were afraid that the answer was going to be wrong and that they would be embarrassed. I also think they were being quiet because the boys already had the teacher’s attention, and they worried they might not be able to get it. My mom and I decided that we should take the experience to my Girl Scout troop. 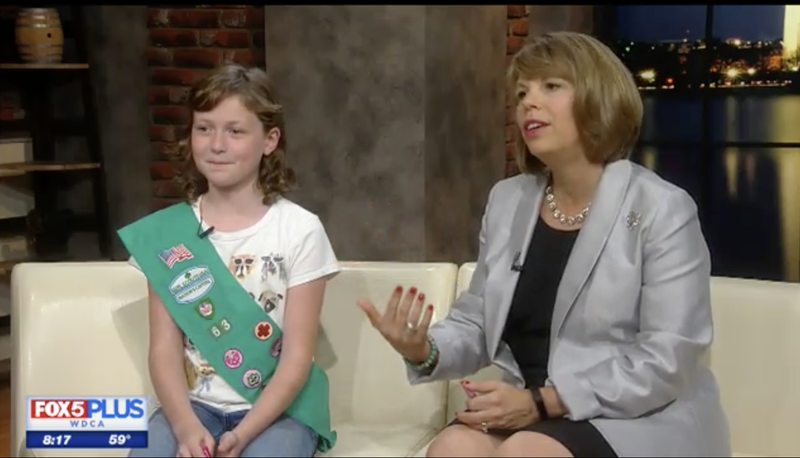 Alice took initiative and created the Raise Your Hand patch for her Girl Scouts troop in Washington DC as a means of encouraging girls to do just that—raise their hands even if they aren’t sure of the answer, and have the courage to speak up. My memory of how Girl Scout patches and the earning of said adornments works is hazy, but for this one, all you do is sign a pledge, recruit three girls to do the same and then keep on fighting the good fight. “I tell girls that we should take the risk and try anyway, just like the boys do,” Tapper wrote. “If the answer is wrong, it’s not the end of the world. It’s not like answering a trivia question to win a million dollars on live TV.” Fair point for 10-year-old girls in classrooms full of boys intent on sticking their hands in the air and holding it up with the other, clamoring for the teacher’s attention—and a fair point for adult women who might lack the unfettered, rip-roaring confidence of their male colleagues who insist they have the answer but are often wrong! !